Erika Petersen, M.D. visits with Jimmy Roberts during a checkup. 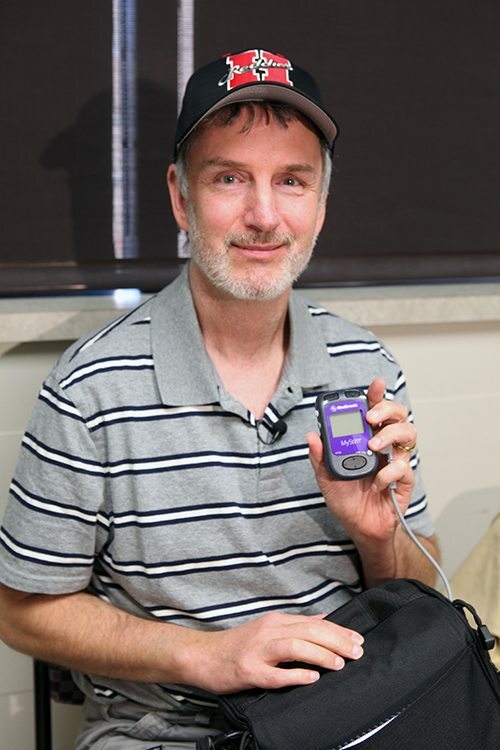 Weeks earlier, Petersen implanted a spinal cord stimulator to help with Roberts’ chronic back pain. April 21, 2016 | April 21, 2016| What Jimmy Roberts wants most is a good night’s rest. The Arkadelphia man has had severe pain in his back for decades starting after two car wrecks in the 1980s. Jimmy Roberts, 50, of Arkadelphia had chronic back pain for many years. He recently became one of the first patients in the world to receive a newly-approved device that will allow patients to receive full-body MRI scans. Up until March 2016, Roberts dealt with the pain through prescription medication. But it never really helped. 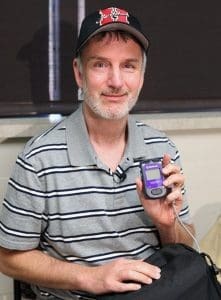 So when his doctor referred him to UAMS neurosurgeon Erika Petersen, M.D., for a procedure using a new device recently approved by the U.S. Food and Drug Administration, the 50-year-old couldn’t wait to get started. 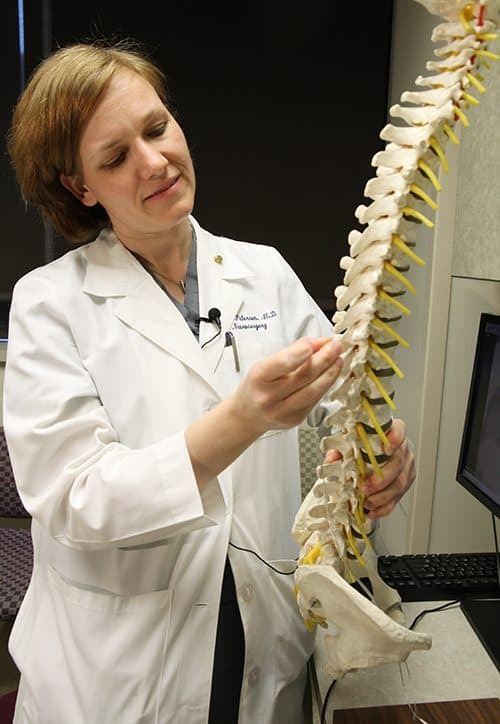 “Chronic pain, particularly chronic back pain, is one of the most common reasons people will visit a doctor,” said Petersen, associate professor in the UAMS College of Medicine’s Department of Neurosurgery. Back pain affects 8 out of 10 people at some point during their lives, according to the National Library of Medicine. While noninvasive options such as medication and physical therapy provide relief for some, others may require surgery or implanted medical devices called spinal cord stimulators (SCS). A SCS is implanted in the spinal canal and sends electrical pulses to block the feeling of pain. Until recently, there was a significant drawback when it came to SCS systems: patients who had the implanted devices were not able to get full-body MRI scans. Physicians often need to have a patient MRI to monitor causes and progression of back pain as well as diagnose other conditions. 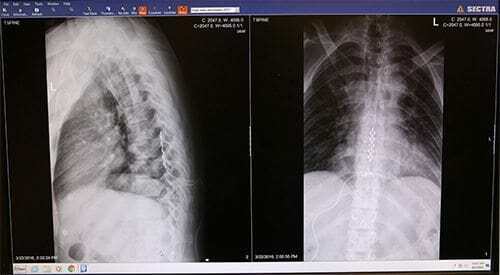 Jimmy Roberts’ x-rays show his implanted spinal cord stimulator. His back pain has decreased since his surgery. Instead, doctors have had to use CT scans, which may not give them all the information need. In some cases, Petersen said, patients didn’t receive the SCS because it was too important for them to be able to have an MRI scan. A few times, Petersen had to surgically remove an implanted SCS because the patient needed an MRI. 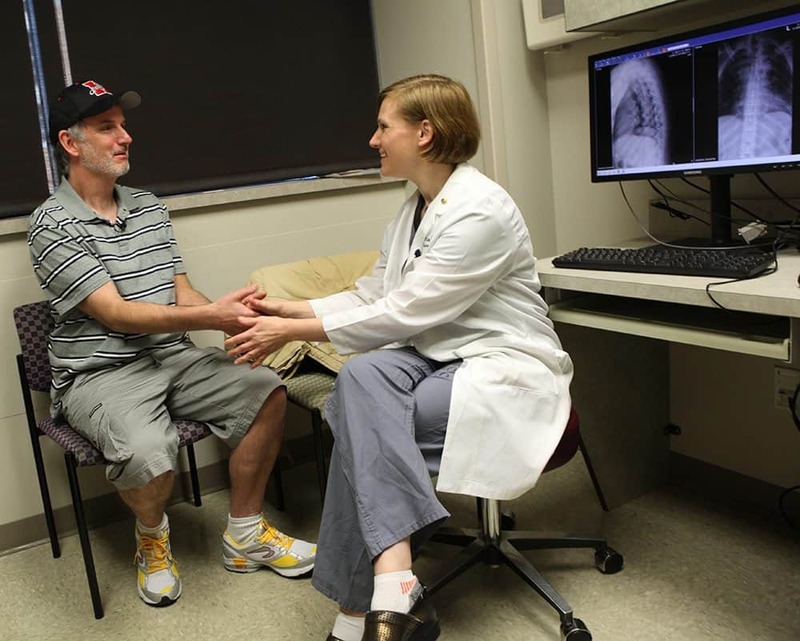 With Roberts’ surgery last month, Petersen became one of the first doctors in the world to implant a newly approved device that will allow the patient to receive full-body MRI scans. The SCS part of the device received FDA approval three years ago, but could only be attached to thin wire electrodes in the spinal canal. With the approval of the Specify® SureScan® MRI surgical lead, which is a paddle-shaped electrode that lies within the spinal canal, the SCS may provide patients more efficient pain relief. The device and the leads were developed by Dublin-based Medtronic, a medical technology company. Petersen was one of the first four physicians to perform the procedure. Erika Petersen, M.D. uses a spine model to demonstrate how the paddle-shaped electrode would go in the spinal canal. Petersen was one of the first four physicians to perform the procedure with the newly-approved Specify SureScan MRI surgical leads. “To be chosen as one of the first to use the device is a real testament to the kind of modern, innovative medicine that we’re offering here at UAMS,” Petersen said. To make sure the implant would relive his pain, Roberts had a trial surgery in early March to assess how well the therapy worked during daily activities before committing to the long-term therapy. Roberts says he’s had several MRI scans prior to getting the implant. He’s happy to be assured that he can still receive them as needed even with the implant. After his eight-week recovery, Roberts is looking forward to playing a game of basketball and getting a full night of sleep.